So, what does the new 'deal' mean in terms of taxes for 2016? I have dates and prices when I purchased metal but no delivery, no possession and no sales dates. What are other people planning on doing for tax year 2016? I think it means that the money you sent in thinking you were buying PM was instead converted into an investment in a startup company (surprise, surprise). Until you relinquish (sell or giveaway) your "shares" in the company, you are stuck holding an open investment so your loss has not been realized yet. I treated it as a capital loss. Had x number of shares in the company, and said shares became worthless. Only problem is that you have no 1099-B, no record of how many "shares" you purchased and no record of a Sale of those shares (to establish the extent of your loss). But as long as you don't get audited you probably don't need any of that stuff anyway. Your last sentence: +1. It's a calculated risk. You have the dollar amount invested and the dollar amount remaining-- zero. No matter what, you made an investment and it is gone, whether it is shares or dollars. I still maintain my losses were theft. I have documents showing the metals that were stored and what I paid for them. They were removed from the vault without my permission. Therefore they were stolen. I would like to declare the loss as a theft loss which is a better tax solution. I've been waiting and waiting for the FBI to do something. Seems hard to believe that the FBI hasn't charged him yet. I would like to declare the loss this year 2016, any thoughts? This may not sound like the obvious choice, but the IRS hands out free advice on how to handle certain ways of filing and will even help you with the paperwork in some cases. I couldn't find out how to handle the filing of a like kind swap because APMEX screwed me and submitted a tax form for the sale of my Silver bars even though I never received any money but received ASE's instead. Their accounting department didn't care, they said all transactions over 1,000 ounces of Silver bars would generate a tax form no matter what. I hunted the internet and couldn't find any help, because I didn't need any. I did everything by the book according to what I found on the net, so there was no need. There were numerous ads on the web wanting to help for a fee, but the IRS agent said no problem, just use this crazy form that doesn't make any sense and fill in this amount on this line and that line and submit it. Great until I received an audit letter, I called some lady that had no idea what I was doing with this form. I explained it to her. She called back a couple days late and said everything is taken care of and have a good day. Your problem may be for more complicated and it may not be. Do you really need the FBI to charge him with theft first to prove your loss by theft, that may never happen if they negotiate a plea agreement. If theft has to be proven, you may never be able to file that way if that Pr!ck can weasel out of his contract with you on the storage agreement and he was sure trying that approach as a defense at one point. If you have a copy of the storage contract along with your documentation showing how much was stored in the "vault" to nowhere, maybe that might be all you need to file a theft claim for IRS purposes, I sure don't know, but asking can't hurt. My guess would be to file it as a casualty loss (loss on deposit) using Form 4684 and Schedule A (Form 1040). The other question is do we claim the current market value for our deposit, or last value on 2016/12/31, or what? I haven't heard of anyone thinking it might qualify as a casualty loss yet, but it might. Part of the issue is that normally a casualty loss needs to be something that occurs suddenly. If we knew all the facts, on what date did this sudden event occur? 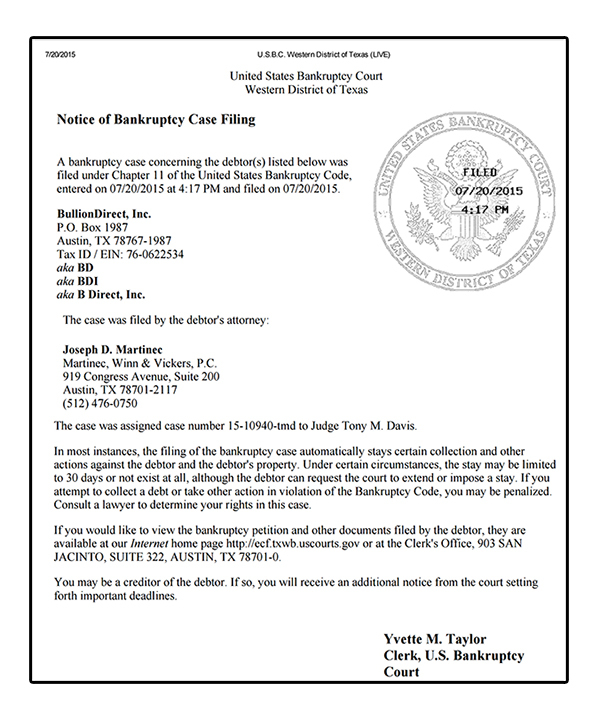 Not the date of the bankruptcy filing, as the money was long gone before then. Not the date of the order, because Charles certainly knew you wouldn't get your order, he may not have done anything that day related to the loss. If he never placed an order for metal for you, then the loss likely occurred over a period of months. So I think a theft loss (if the hurdles can be met, such as "intent" -- although that should be pretty easy in this case) or a capital loss are the most likely options. As for the amount of the loss, for a capital loss, I believe the amount claimed would be the basis (in most cases, what you paid), assuming you get nothing back from Bullion Direct (that's another tricky piece). For a theft loss, https://www.irs.gov/publications/p17/ch25.html says "Several years ago, you purchased silver dollars at face value for $150. This is your adjusted basis in the property. Your silver dollars were stolen this year. The FMV of the coins was $1,000 just before they were stolen, and insurance didn't cover them. Your theft loss is $150.". That is similar to a stock: if you buy a stock for $150, it goes up to $1,000, and then news comes out that makes the stock worthless, you get a $150 deduction and not a $1,000 deduction. It doesn't seem fair (e.g. you get nothing for a priceless heirloom handed down to you), but that's what it is. I haven't heard of anyone thinking it might qualify as a casualty loss yet, but it might. Part of the issue is that normally a casualty loss needs to be something that occurs suddenly. Deductible casualty losses can result from events like: Loss on deposits when a bank or other financial institution becomes insolvent or bankrupt. Now, this loss would likely also qualify as embezzlement, listed under theft. However, we would have to prove criminal intent for that classification - which is not done yet while this case is still pending. But, it makes no financial difference in the end if we classify it as a casualty or theft loss anyways, since the deduction calculation is the same in either case. Hence, I would just file it under casualty loss because that's already been proven. Figure your adjusted basis in the property before the casualty or theft. Figure the decrease in fair market value (FMV) of the property resulting from the casualty or theft. From the smaller of the amounts in steps 1 and 2, subtract insurance or other reimbursement you received or expect to receive. So, let me see if I understand this right? Let's say you bought $1000 worth of gold, which became worth $2000 at the end of 2016. Yesterday, Bullion Direct filed a declaration that stated that “when a customer placed an order, the precious metal was not actually purchased unless the customer agreed to take actual delivery of the product.” In other words, they never bought the metal customers purchased if it was to be stored. According to Bullion Direct's statement, somewhere around 6,000 customers bought $25M of metal from Bullion Direct, and to store for them -- but Bullion Direct did not actually purchase the metal. Of course, Bullion Direct's customers didn't know this because when the company's customers paid the company for bullion and storage, Bullion Direct would show the metal in their portfolios. Now we know that these holdings never existed. In 2011, Bullion Direct created a subsidiary Nucleo Development Co. to handle the software platform, expand it to other markets, and license the patent. At times, Nucleo reportedly had over 30 employees. What customers did not realize is that Bullion Direct "transferred funds to Nucleo for start-up expenses and continued funding Nucleo’s operations until shortly before the Chapter 11 filing." Connecting the dots, it appears that Bullion Direct took money customers were sending in for metal and spent it on Nucleo's operations, research, and development. According to court documents, there are as many as 6,000 creditors (although, I believe that number is low, and closer to 8,000), and they are owed "perhaps as great as $25M." A Joint Stipulation between Bullion Direct and the depository shows inventory that I calculate as being worth roughly $635,000. That's about $.03 of real metal for every $1.00 of metal supposedly being stored. The bankruptcy petition gives a range of $10M-$50M for the value of the assets, which presumably means that the intellectual property (mainly the patent and software) is believed to be worth at least $9M. You can't deduct the "current" appreciated value of the metal because you never paid a capital gain on it's appreciated value. Thus this is an unrealized gain. If you buy stock at $100 and it shoots up to $1000 (but you don't sell) and then it bottoms out at $0, then your lose is the $100 you paid for the stock, not the $1000 that you might have capitalized on. But had you sold at $1000 and then immediately re-bought the stock at $1000 and then it went down to $0, you could claim $1000 loss. BUT you would have also had to claim a $900 gain when you sold at $1000. So in the end, you would have a $900 gain minus a $1000 lose and sure enough, you are back to a net lose of the $100 original basis. You can't deduct the "current" appreciated value of the metal because you never paid a capital gain on it's appreciated value. Thus this is an unrealized gain. Well with stocks, you only pay tax once you realize their gain. But, this is understood just to be a matter of time - of when to pay the tax. As there is no question that you will realize the gain and pay taxes at some point. The only question is WHEN (and by extension, how much?)? The question of how much to deduct, versus what Bullion Direct is liable for. The amount that Bullion Direct is liable for has already been determined (the dollar amount of your claim). The amount that is deductible is a separate question, and based on the IRS formula. Then there is also the possible issue of whether Charles and/or others would be liable for more than what Bullion Direct is (for example, if it is proven that there was a crime, or a class action with damages). Well after all this speculation, I just called the IRS (800-829-1040) in hopes of clarification...but after selecting down through all their options (1 2 2 4), I was informed ONLY at the very end that they no longer answer tax law questions live on the phone and we should consult their website instead. It was basically like - to find A, jump through all these hoops - and then after 4 hoops, they finally inform you that they no longer answer A. SO WHY THE F DO YOU EVEN STILL LIST A UPFRONT TO BEGIN WITH??? Anyhow, they want us to pay them taxes...yet are not even willing to help us figure out how to pay them! I mean, you'd think if they really wanted it, they'd at least try to make it easier for us to give it to them??? Has anyone here actually talked to a licensed tax accountant about this?